I lived on the edge of Ffynnon Gynydd common almost all my life and our house was a Council Holding of six acres named Upper Bank. This is now a Stonehouse Gang Hostel called Tycarreg and is maintained and run from Birmingham. The house looked across the valley to the hamlet of Ciltrwch and as the Council had properties in both hamlets it was necessary to provide a water supply to both sides of the valley. This was achieved by taking water from the valley brook and filling reservoirs on each side by means of an Hydraulic Ram. I am writing this article because there is little evidence left of the existence of this system but it was such an important and interesting invention and very advanced when it was first installed in the 1920/30’s ( not sure of the date. ) The system was discontinued in the late sixties when the mains water supply was provided. Starting at the beginning, water was diverted from the brook into a fairly large reservoir upstream, which can no longer be seen. From there it was piped for two to three hundred yards along side the brook to a smaller filtering reservoir which has also been lost, at the same time gaining height on the brook as this height difference would be necessary at the ram end. It then travelled a further two to three hundred yards to a second small reservoir, which can still be seen. This reservoir contained the shut off flap which could be closed and allow any maintenance on the ram to be carried out. By the time it reached this point it had gained approximately twenty feet in height and this head of water was essential for the ram to do its work. The ram was dome shaped looking very much like a world war one bomb stood up on end and it was set in a stone walled pit with a wooden step ladder to get oneself alongside it. The action of pumping water was a pulsating cycle similar to a strong heartbeat with two valves opening and closing alternatively; one valve would be open while the other was closed. The maintenance of this machine was virtually nil, the first valve at the base of the dome called the check valve was never in need of attention, unlike the second valve on the waste side (waste valve) which was made of brass with lots of small holes which were blocked off in the cycle and opened by two rubber bands four inches each. We found that a 450” by 17” car inner tube was a good substitute for the real thing, these bands would become perforated after a time so the only repair that the machine needed was replacement of the two bands every so often. 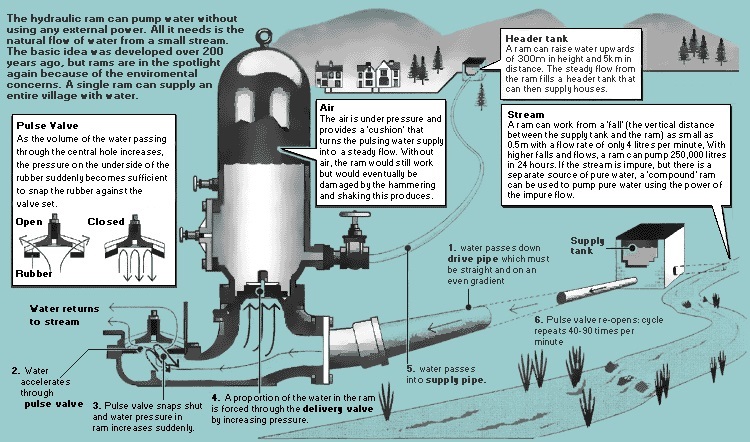 During the cycle the check valve would open and as the waste valve was closed water would have to be pushed into the dome, thus creating an air pressure and as the delivery pipe was taken from the lower half of the dome the air pressure smoothed out the pulsations of the cycle in order to have a more constant delivery; all very cleverly thought out. During a twenty-four hour use the ram would push approximately four thousand gallons up about three hundred yards into our reservoir, but it would only do one side of the valley at a time. Taps had to be swapped as needed to supply both sides of the valley. Four houses were supplied on our side and several more at Ciltrwch. As I pointed out at the beginning, this wonderful set up is fast disappearing and sadly just a few years ago someone covered the ram with soil and rubbish. I know the spot to within a foot or so and if anyone would like to grab a spade and have a dig I would gladly point them in the right direction.